Finding a clean change table while out and about can be a challenge. Baby Change-N-Go is a game changer for parents because it provides a private, clean and convenient nappy change area wherever you happen to be. Baby Change-N-Go is designed to hang from the doors of public toilets. With just one hand, the unit can be hung and unfolded, providing parents with a clean and stable surface to change baby. It’s made of tough materials, has handy storage pockets for wipes and folds flat to fit in your nappy bag – how’s that for convenient? 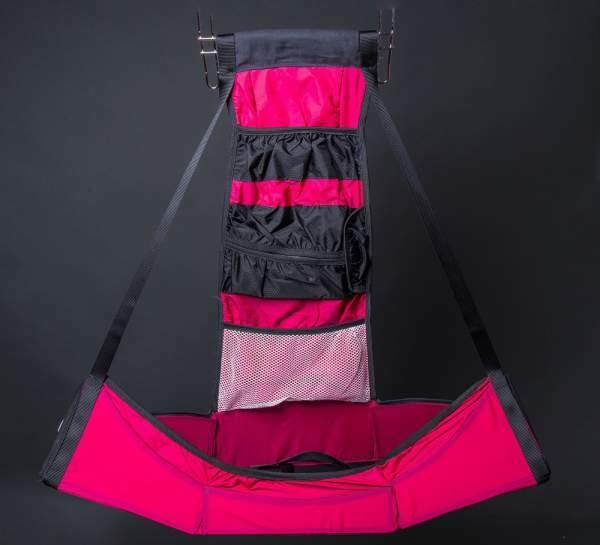 In pink, royal blue and charcoal, Baby Change-N-Go can be used for children up to two-and-a-half years, or weighing up to 18 kgs. You can show your support for the product on Kickstarter where a pledge of US$89 will get you a Baby Change-N-Go in your choice of colour.